A heartfelt smile brings a twinkle to the eye, and sometimes, ‘smile lines’ around the eyes. Smile lines are the fine to deep lines that spread out from the outer corners of the eye, most commonly caused by repetitive muscle action when we smile. These are a natural and positive expression that we all have when we smile or laugh. And as a part of the natural ageing process, these lines can sometimes become deeper and permanent even when we are not smiling, resulting in a condition called Crow’s Feet. What is Crow’s Feet and what causes this condition? When we smile, the orbicularis oculi muscles around our eye socket contract. This causes the skin to be pulled inwards and cause creases. Over a period of time, the repetitive muscle contraction and skin creasing result in fine lines and wrinkles around the eyes. The skin around our eyes is very delicate and thin, and is often one of the first areas that show the signs of ageing. As we grow older, the skin’s collagen and elastin levels go down, lessening its elasticity, and this makes us more susceptible to these wrinkles around the eyes. Other factors that could likely cause crow’s feet are smoking, squinting, frowning and even high sun exposure. Can this condition be treated? Yes, so you have no reason to frown! This condition can be treated and with a simple cosmetic, non-surgical procedure. Anti-wrinkle injections are a great way to treat Crow’s Feet without surgery, and at Nitai, we have helped thousands of women (and a few men too) to get rid of their crow’s feet. Anti-wrinkle injections contain a protein that causes the orbicularis oculi muscles to relax. This reduces their ability to crease the skin surrounding the eyes, and minimizes the formation of fine lines and wrinkles. It also smoothens out the existing wrinkles and reduces their intensity. Having said this, smile lines or crow’s feet are a natural occurrence when we express our emotions. And having them to some extent makes our face look natural. So it is important to not overdo these injections or the dosage, as it could result in what is called a ‘frozen face’. In case the wrinkle lines run deep, then dermal fillers can be used to fill them out. How long does it take for the results to show? Most people can see visible improvement within 7-10 days of treatment. We might use some local anaesthetic cream in the area to be injected, to numb the skin before we administer injections. This will numb any sensations of pain. A vibrating device is used over the area to be treated. What this does is that this causes a ‘traffic jam’ of sorts in the nerve pathways that send pain signals to the brain, so that you don’t feel pain. Ice is used as a natural anaesthetic in this case. Sensations of pain travel along the same nerve pathways that also transmit sensations of temperature. Icing the skin before injections minimizes the level of pain experienced. Nitrous Oxide, or laughing gas is often used during painful dental procedures or during labour. This is inhaled, and the effects tend to wear off quickly after the procedure. Bruising can also happen during this procedure, if the needle disrupts or bursts a vein under the skin. But to avoid this happening, our team uses the advanced Acccuvein Vein Finder, which allows us to visualize veins beneath the skin and adjust the position of the injection accordingly. At Nitai, we always believe in taking extra care so that you do not experience any unnecessary discomfort. What is the post treatment care? We recommend that post treatment, the skin around the eyes is nourished and hydrated. There are many over the counter and prescription products that you could use. Aspect Dr. Facelift is one such product that helps to reduce dark circles, puffiness and fine lines. Synergie Revitalize is yet another lightweight eye serum, that has been specially formulated to treat under eye skin. BiopelleTensage Dual Eye Care Kit is an effective anti-ageing kit for the eyes, that moisturizes and protects against free radicals, and repairs the delicate surrounding skin while we sleep. Why choose Nitai Cosmetic and Medical Centre? Our highly experienced doctor and staff are adept at treating Crow’s Feet without making the face look frozen or unnatural. And we know that is what you would like as well, isn’t it? So go on and share your smile with the world, as we will make sure you won’t have any reason to frown! Most of us have been affected by acne at some point of time. And as if that wasn’t bad enough, some of us even have tell-tale signs of the past in the form of acne scars. It almost seems like a double punishment, doesn’t it? Thankfully, you don’t need to live with these scars from the past, as advances in cosmetic dermatology offers us multiple ways to treat these. 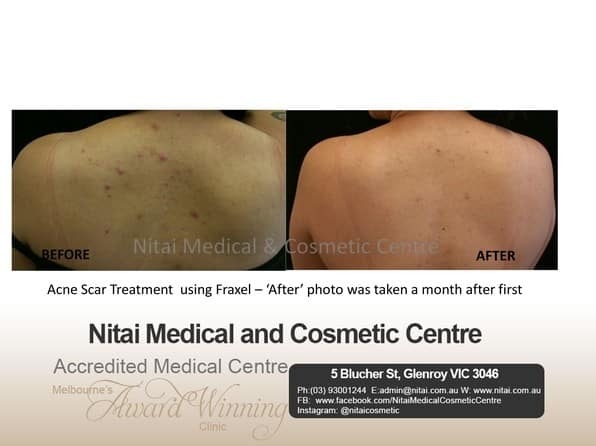 Nitai Medical & Cosmetic Centre, considered to be one of Melbourne’s leading cosmetic clinics, is a trusted name when it comes to effective treatments for acne scars. So before we look at what are the available treatment options, let us take a closer look at what actually causes acne scarring. There are different types of acne, ranging from mild to severe. The severe cases of acne, if left untreated, leave behind textural changes and marks or indentations on the surface of the skin, commonly known as acne scars. The skin’s pores get filled with dead skin cells, excess oil and bacteria, and this is what causes acne. Sometimes, these pores can swell and burst and cause lesions. Shallow lesions are rather minor and take less time to heal, but sometimes, deeper breaks in the wall of the pore causes the infected material to leak on to surrounding skin tissues, causing deeper lesions. When this happens, the skin creates collagen to repair the damage caused by these lesions. 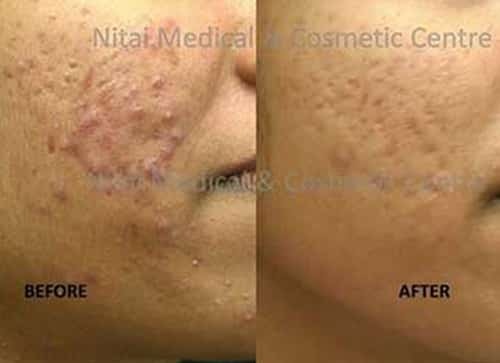 And because this repair work may not be as smooth as the original, it results in what is commonly known as acne scars. Picking on or squeezing active acne can also result in scars. Your skin type influences the kind of acne scars you can get. Hypertrophic scars are formed when the skin produces more collagen while healing and results in a mass of raised tissue over the skin. Atrophic scars, on the other hand, are caused when skin tissue is lost during the healing process. 1. Boxcar scars: These are typically depressed scars with sharp, well defined edges. 2. Icepick scars: Icepick scars, like the name suggests, are deep and narrow, and go all the way down to the lower layer of the skin. 3. Rolling scars: These are the most common, and are in the form of indentations and undulations on the skin. How can you treat acne scars? Fraxel Laser, or fractional laser technology, is a safe way (with a well understood risk profile) to treat minor to more severe skin damage, especially when it comes to skin resurfacing for damaged skin. It can also be used to rejuvenate the skin, as well as for melasma, skin tightening and wrinkle treatments. In this treatment, damaged skin is targeted with microscopic columns of laser, which are designed to penetrate into the deeper layers of the skin. These lasers columns focus on a highly targeted area of skin at a time, without affecting the surrounding tissues, and create minute wounds. This helps to trigger the body’s natural healing process, and old damaged cells are replaced with fresh new ones, so that the skin looks fresher, younger, smoother and more radiant. This treatment modality requires minimal risk and downtime, and is an ideal for most skin types. Most clients need between three to five sessions of this treatment for best results. CO2 Lasers are also fractional, ablative lasers that have long been used to effectively treat acne and surgical scars, as well as stretch marks, wrinkles, pore size reduction and skin tightening since 1964. How this treatment works is that the laser penetrates into the dermis through micro holes, and produces heat. The micro damage caused triggers growth of new cell tissues and remodeled collagen to repair the damage, and smoothens out the scarring. Usually CO2 lasers show noticeable improvement in just one session. However, they need more downtime than Fraxel Laser, requiring around 3-5 days post treatment. However, this treatment type may not be suitable for all conditions – i.e. on darker skin, cancerous lesions, skin diseases or during pregnancy. Moreover, it is usually not recommended for use as a standalone treatment, as it could lead to hypo or hyper pigmentation. So it becomes important to consult an experienced cosmetic doctor to decide on the right treatment for you. RF Microneedling is an advanced, non-laser method to treat deep acne scars and wrinkles. This works best for rolling scars and for darker skin types, and uses a combination of radio frequency and micro needling. How this works is that controlled radiofrequency energy is delivered to the deeper layers of your skin (the dermis) below the pigmentation through a micropen, without affecting the upper layers. This layer contains cells that manage blood circulation, and trigger production of new collagen and elastin. RF Microneedling activates cell renewal at a deeper level, which reduces the bumps, indentations and the inflammation caused due to skin damage. This method involves minimal discomfort, and might require a few treatment sessions before one can start seeing results, and smoother skin. There is also negligible risk of hypopigmentation or hyper pigmentation. Dermal fillers are a non-surgical technique that can help smoothen out acne scars and skin undulations, by lifting the scarred area to the same alignment as the surrounding skin. These fillers can use fat from the abdomen, hips or thighs – to ensure a smoother acceptance by the skin. Dermal fillers are great for enhancing volume as well as for triggering elastin and collagen production for skin renewal. Depending on the type of scars, these can either be used as a standalone treatment or in combination with other treatments. Depending upon your specific skin condition and the severity of scars, our doctor might also recommend going with other treatments like skin peels or microdermabrasion. So now that you have seen it is possible to have clear, scar-free skin, does it really make sense to live with these scars from the past? Of course not! 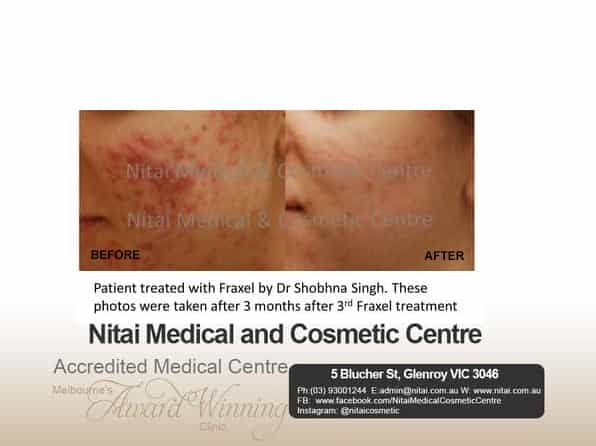 Nitai Medical & Cosmetic Centre is one of Melbourne’s premier clinics for treatments in acne scarring. Our team has stayed abreast of the latest in cosmetic dermatology, which will enable you to look your best, always. Come by for an initial, no obligation consultation will help you determine the right treatment methods suitable for your skin type and condition, and know the results that you can expect. We wish you a clear, bright and beautiful future. What Makes Laser the Best Hair Removal Treatment Today? Throughout millennia, hair has played such a crucial role in self-expression across cultures the world over. Wearing it long or short, cutting it in different patterns or shaving it off completely are all reflections of our different cultural histories. And while scalp hair is one thing, the issue of body hair has been quite contentious through the years, with men and women choosing to use different means and tools to manage it, from threading, shaving and waxing for temporary hair removal, to electrolysis and laser hair removal for a long term solution. Laser hair removal has greatly improved in the last few years, with pain-free and longer lasting treatments available today. Older laser technology was not suitable for all skin and hair types, but recent advancements in laser technology have made it possible to work on most skin and hair types, making it a preferred option for many. What is better is the fact that it can work on almost any area of the face and body, and is an ideal choice for removing unwanted hair from the face (especially the upper lip and chin), neck, chest, arms, back and the bikini line too! Laser is the easiest and quickest way to get rid of unwanted body hair. And there are many reasons that make it the best option for those of you looking for long term hair removal. Move over the pain of waxing or tweezing, as it will soon be a thing of the past. Modern lasers have an array of settings that allow for treatment of different body areas, which include delicate areas as well. Moreover, they come with cooling tips that keep the skin cool and comfortable, and prevents the risk of burning. This is a far cry from older lasers, which were actually quite painful to endure because they did not have cooling tips and the extreme heat would make it difficult to sit through it. Laser hair removal treatments have been around for 20 years, and have been tried and tested by many. They are precise and effective and target only specific hair follicles, which makes it a safe mode of treatment for most (with a well understood risk profile). The best part about laser hair removal is the fact that the treatment can range from a few minutes to an hour at most, depending upon the area to be treated. It can be as easy as walking in and walking out within your lunch hour! Unwanted body hair can not only be embarrassing, but it could also affect your confidence and expression in a social setting. And laser hair removal makes for a very effective way to get rid of ingrowth, and prevent their future occurrence. Think of all the time that you will save in repeated salon visits and shaving. You’ll always be ready to go anytime you decide to, without the worry of having to remove unwanted body hair. Now, isn’t that a nice place to be in? Not sure if your skin will take well to laser hair removal? Worry, not. Because at Nitai, we use medical grade laser options including IPL that are suitable for all skin types, under the direction of our doctor. So you can rest easy knowing that your skin will be taken care of, during and post treatment too. Laser hair removal treatment is usually a one-time investment with long term benefits. What this will do is save you the time, money and hassle of never-ending salon appointments, razors and shaving creams. While it may seem like an expensive proposition in the first go, it certainly turns out to be more economical over a longer term. Usually, the areas of treatment are shaved some days before the treatment. In some cases, just before the treatment, an aesthetician could apply numbing cream to reduce any painful sensations. The aesthetician will adjust the laser intensity and direct it at certain test spots, before commencing treatment, to ensure patient comfort and effective treatment. Laser treatment works by acting on hair follicles in a certain phase of their growth. And if the follicle happens to be in the desired phase of growth, the laser can effectively act on it to prevent growth of new hair. However, in case the follicle is in a different phase, then there could be a chance that it might grow new hair. And at any point of time, we typically have 10-30% of hair in the growth phase. Some of these follicles might only appear after the treatment. And due to all these reasons, it might require multiple sessions to treat all of the hair follicles. So it’s time to say goodbye to waxing and throw away your razors, as laser hair removal is here! If you’re fed up of the monthly shaving, waxing and tweezing, and are on the lookout for an effective permanent solution, then laser hair removal is a great choice for you. It is important that you visit an experienced, certified professional who will know the right power and pulse frequency to be administered, based on your skin and hair type. Reach out to us at Nitai Medical and Cosmetic Centre to come closer towards smoother, silkier and hair free skin! Most of us wish to exude youth and vitality for as long as we can, right? And while there is much more to being young, looking good is a fairly sure way of feeling young. And our face is often one of the earlier markers of age. Over time and age, our facial skin tends to undergo a change. This happens due to the breakdown of our skin’s collagen and elastin network. One of the key changes that you will notice is volume loss, which may result in skin folds, fine lines, wrinkles or even sagging and shriveling. Not only do these make us look older, but often, they cause a dent in our confidence. Because as you will agree, our face is an integral part of our identity, and a happy, relaxed and confident face goes a long way in projecting who we really are. Advancements in cosmetic treatments have now made it possible to have a fresh-looking, youthful face without any surgery. You can change your facial contours, be it getting a more defined jawline, plumper lips, fuller, firmer cheeks or a smoother neckline, and also get beautiful, wrinkle free skin while at it – all without going under the knife, only with dermal fillers! When can dermal fillers help? There are many different types of dermal fillers, and our cosmetic doctors will choose what is best for you, depending on your skin type and requirements. Finer fillers are used areas where the skin is fine, and a fine, smooth finish is required, such as the under eye area. Thicker fillers are used in areas like the jaws or cheeks, where more bulk is needed. Choosing to sculpt your face with dermal fillers has many advantages over a facelift surgery. –	For one, they don’t cause as much discomfort, apart from some minor bruising or swelling, which usually subsides within 2 days. –	You won’t need to factor in much downtime, as most of these procedures can be done in less than an hour. You can go back to work the very next day after your procedure. –	You can begin to notice the results immediately, though it might still take a couple of weeks for significant results to start showing. –	Unlike a surgery, the cost of this procedure is much lesser. So you can look the way you want, without having to shell out a fortune. What can you expect during the procedure? The actual procedure is preceded by an initial consultation, where we will examine your skin and facial features, and look at how to enhance and balance out those features to get you the required facial contour. This is the time that we will decide and share about the fillers we will use, where we intend to use them, the possible risks as well as the cost of the procedure. 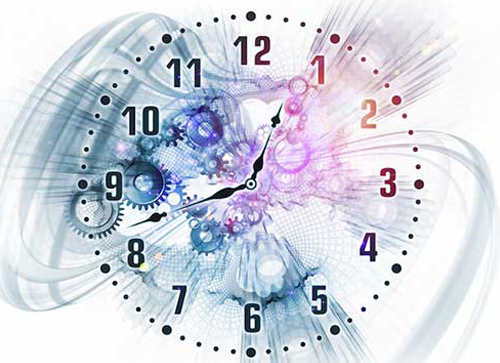 Once you agree to go ahead, we give you an appointment at a mutually convenient date and time. Before the procedure, we use an antiseptic solution to cleanse your face. We could apply a topical numbing cream or ice over the area to be treated, to reduce the intensity of pain. Sometimes, we may also mix the filler with a local anaesthetic, for minimal pain. –	The round tip of the cannula allows the doctor to feel each structure and any resistance that comes in the path, so that an alternate path is probed. This will help avoid damage to arteries and veins, and will cause less bruising as well. –	Being longer in length over needles, cannulas allow for filling many areas on your skin through a single entry point, thus causing lesser trauma to the skin. During the procedure, we take special care to avoid the possibility of the needle disrupting a vein and causing a bruise, with the Accuvein Vein Finder. What this does is visualize veins below the skin, so that we can suitably reposition the injection point to prevent vein bruising. Will this need heavy duty post treatment skin care? This procedure causes minimal bruising, and as mentioned earlier, you can go back to your routine almost immediately. However, we do recommend using a hydrating moisturizer that will also add more volume to the skin. The Aspect Dr Hyaluronic Serum does this, and is also suitable for most skin types. Dermal fillers have opened up possibilities to have the kind of face that you have always desired, and the fact that you can do this without surgery, with lesser pain, time and costs is like the cherry on the proverbial cake. At Nitai Medical & Cosmetic Centre, we are known for our very experienced staff, and our commitment to your well-being. And if you’re looking for ways to enhance your facial features, reach out to us and know how you can make the face of your dreams, a part of your everyday reality. Are you not happy with the size or shape of your nose? Have you always wished for a different nose, one that was smoother, sharper, and just right for your face? Well, the good news is, it’s possible to give a new look to your nose in just an hour, with non-surgical rhinoplasty, at Nitai Medical & Cosmetic Centre in Melbourne! Non-surgical rhinoplasty, as the name suggests, is one of the quickest and easiest ways to get a nose job, without the costs, pain and downtime associated with surgery. A new nose can instantly change your overall facial appearance, giving your face much needed balance. The best part about non-surgical rhinoplasty is that it is not a permanent treatment, and you can always revert back to your earlier look if you don’t wish to retain the new look. So if you wish to experiment with the shape of your nose and your overall look, non-surgical rhinoplasty could be a good option for you. How does non-surgical rhinoplasty work? So whether you wish to fill in an indentation, correct a drooping nose tip, cover up a small bump, this treatment is an ideal choice of treatment to have a well-balanced nose, in proportion to your facial features. Non-surgical rhinoplasty uses dermal fillers to add more shape at specific points on your nose, so that the shape of your nose is enhanced. Dermal fillers add more volume to the skin, making it look fuller, smoother and younger. And the best part is that these fillers are created with a material that is naturally found in skin, which makes it easier for the skin to absorb it. We start off the treatment with taking photos of you before treatment, so that it becomes easy to compare to your post-treatment result. We use a numbing cream to reduce the possibility of pain or discomfort. Our experienced cosmetic doctor then injects the dermal filler at precise locations, based on the desired nose shape. Depending on the area being injected, the filler could be fine or thick. In one session, dermal filler could be injected in several points on or around the nose. We use long lasting filler for results that will stay for longer. After the procedure, we apply a cooling pack to the treated areas, to reduce bruising and soreness. However, you could experience minor swelling and bruising after it. And a few could experience a tender nose. What are the associated risks with non-surgical rhinoplasty? – Redness, swelling and bruising. These tend to subside within a few days. This makes it all the more important to choose the right clinic and the right team if you plan to get a non-surgical rhinoplasty procedure in Melbourne. Nitai is known for its commitment to safety and care, and with our trained cosmetic doctor, you are in safe hands. Moreover, we use blunt cannulas instead of needles for added safety. This also allows for a better judgement of where the injection will go. After any kind of procedure, it becomes essential to care well for our skin. We recommend keeping your skin clean and moisturized at all times. A good diet and good sleep can accelerate the healing process. We might also recommend products like Aspect Dr Exfoliator / Aspect Dr Exfol A Plus to exfoliate, soothe and calm your skin. At Nitai, we make sure that all our patients get personal attention and support, pre and post-surgery. We are known for our professional and reliable treatments, and this is the true reason why our patients leave from here feeling refreshed and reenergized. Eye bags are never a pretty sight. You can have great skin and good features, but if you also have eye bags, they will stand out like a sore spot on your face. They can make you look tired and weary, and even aged. And you can definitely do without them! Thankfully, you don’t have to live with eye bags all your life as there are many ways to treat them. Before we look at how we can treat eye bags, let us look at what they really are. Under eye bags are caused due to the protruding of the fat that usually sits behind the eye. There could be many possible reasons for this, from genetic to ageing to lifestyle habits like inadequate sleeping. They can also appear at times when we are tired and unwell. In some cases, these could be the result of certain allergies or dermatitis too, and these are usually accompanied with redness and itching. Eye bags could also be caused due to tear troughs under the eye bags. A tear trough is a slight depression along the path that a tear runs down your face from the eye to the cheek. which are ligaments that pull down the skin beneath the eye, causing the fat pad below the lower eyelid to bulge out and creating a puffy, under eye bag. How can we treat them? There are both surgical and non-surgical options available for this treatment. Most people achieve good results without surgery, and don’t need to go in for surgery. Under eye bags can often be completely managed non-surgically, with dermal filler injections in the tear trough area. An initial consultation will help to determine if you need to go down the surgical route or not. Dermal fillers are usually made using a substance naturally found in the skin, which makes it easier for the skin to accept the fillers. This procedure involves injecting dermal fillers into the skin at strategic points on the face. These fillers are very effective in filling up sunken area beneath the lower eyelids, or even the trough area so that the skin between the lower eyelid and the cheek evens out – giving an instant youthful appearance. These are also quick and usually take 30 minutes or less. If you need to get your tear troughs filled, then you need to ensure that you are in expert hands as there could be multiple treatment modalities involved for dark circles, eye bags and hollowness under the eyes. When the hollow area is filled up with the right filler, your face will instantly look different. This may not improve skin texture or under eye wrinkles. In cases like these, PRP can be effective in stimulating and regenerating periocular skin. Sometimes, “under filling” is better than “over filling”, as the latter can result in a tired looking appearance that is totally avoidable. But you need an experienced cosmetic doctor to be able to discern the right amount of filler, and you can always count on our team at Nitai for trained and proficient treatment. Dermal fillers are considered to be quite safe (with a well understood risk profile). At most, there could be very slight bruising / swelling at the spot, and these are quick to heal. The best part of using dermal fillers for tear troughs is not only the fact that it is a super quick procedure that requires no downtime, but also that the results last for as long as 12 months. How do I sustain the treatment results? No matter what kind of treatment you end up going for, it is important to keep the delicate skin around the eyes well-nourished and moisturized. And we recommend using Aspect Dr Eyelift before and after the treatment to keep the skin nourished. We also recommend Eye Doctor eye cream to help with improving skin texture and colour. Revlight laser helps to break up pigmentation in the under eye area. Sunscreen and sunglasses are also important to prevent dark circles. Things like these not only to optimize but also sustain results. Dermal filler injections are a great way to achieve more uniformity in your facial skin. Reach out to us to know more! 1. Are they suitable for all? Our consultation before the procedure starts will ascertain whether dermal fillers would be right for you. In our experience, most people can go ahead and get dermal fillers. However, there are a few exceptions like women who are expecting, or lactating mothers. Some fear that a botched procedure could result in puffed up faces and lips, but dermal fillers have come a long way today, and can give amazingly precise results. Moreover, fillers can be used all over the face to achieve a naturally balanced look. Moreover, if you choose to get your treatment at a reputable clinic like Nitai Medical and Cosmetic Centre, you can rest assured that your treatment is in experienced hands. 3. Will it be painful? A lot of clients are often surprised at how pain free this procedure is. This is because we use very fine, sterilized needles to inject the fillers so at most, you might feel a prick. The fillers also contain a local anaesthetic, which desensitizes you to any pain during the procedure. We also take additional care with some ice packs / numbing cream in case needed, so that you are comfortable and pain free. 4. When will the results start showing, and how long will they last? Dermal fillers can give almost instantaneous results. The treated area could be slightly red and / or swollen, though this largely settles down in a few hours. Subtle swelling could last for up to a week. The final results start showing after 30 – 45 days of treatment, and depending on the treatment area, type of filler, and post procedure care taken, these could last anywhere between 6 months to 2 years! 5. Will dermal fillers require much downtime? Most clients can usually resume work within a day of treatment. However, we recommend that you do not get your treatment immediately before a big event / special occasion, as there could be minor swelling and bruises which typically take 2 weeks to subside. Wherever you choose to get your dermal filler treatment, ensure that the clinic has well qualified and experienced aestheticians on hand and that you know about all the possible risks that are involved with the procedure. 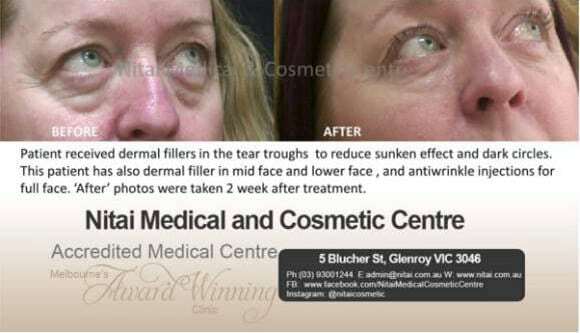 Nitai Medical and Cosmetic Centre is reputed for offering high quality dermal filler treatments in Melbourne. We want all our clients with all the information necessary before they decide to go in for any procedure. And this is why we encourage our clients to ask any questions that they might have, without hesitation. Our pre consultation also helps address these concerns and more. Feel free to reach out to us for any questions on how you can get younger looking skin with dermal fillers. Do you have a mole that has been there for quite some time? Have you noticed that it has changed at all since it first appeared? Any time you have a mole, you will want to keep a close eye on it. If it starts to change quickly, you will want to make sure that you have the checked out. It is really important to get a mole check from time to time to ensure that you don’t have skin cancer. Frequently, people will just overlook a mole and then find out that it is something more serious. When it comes to a mole check Melbourne residents understand that it is really important to catch it early. If you detect skin cancer early on, then you can have it treated and have a far greater chance of success with the treatment. Melanoma is quite prominent in Australia. If you don’t treat it in time, it can prove to be fatal. This is why you should go in and have your moles checked out. After you have a mole check, you will want to make sure that you take heed to the advice that you are given. Sometimes, moles are harmless. From time to time, they end up being something more serious that can lead to cancer. 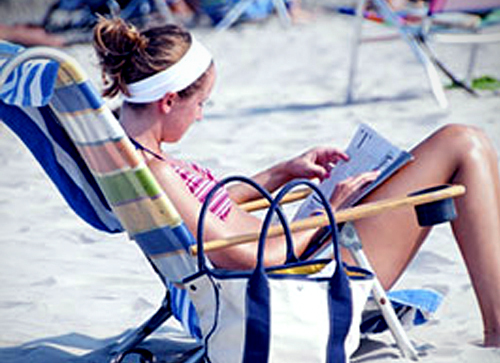 Skin cancer should be treated right away. If you find out that your mole may be cancerous, you don’t want to put it off. You should get medical treatment right away to help improve your chances of getting rid of the cancer completely. If you have a mole that you want to have checked out, then contact us at Nitai Medical & Cosmetic Centre. We would be more than happy to schedule you an appointment and check it out. Vying for that perfect pout? Lip fillers are a popular way to add more fullness and definition to your lips in a non-surgical way. These injectable fillers are an almost painless way to get plumper lips. Nitai is among the leading cosmetic clinics in Melbourne offering lip augmentation treatments, and our cosmetic doctors have helped our patients get the lips, and the look that they’ve always wanted. We are experienced in lip filler treatments that achieve a natural look – where the upper and lower lips are evenly and precisely enhanced to make it seem like you were born with them! However, lip fillers can also go wrong at times. Too much injectable filler could make your lips look botched up, and fake. But how much is too much? A recent study by JAMA Facial Plastic Surgery set out to find just that when it asked a mixed group of about a hundred women and men participants to review and rate photos of a female model’s lips, which were digitally modified to different levels, in different combinations – upper lip, lower lip, upper and lower lip and the shape of the Cupid’s bow. Participants had to share whether they found the lips attractive and natural, or fake and unnatural. The study threw up some interesting findings. 50% of the participants found lips to be cosmetically treated, and therefore “fake” when the lower to upper lip ratio was less than 0.92, or greater than 1.48, while the remaining 50% found lips to be artificial if this ratio was less than 0.85, or more than 1. So essentially, the attractiveness and natural look of lips was influenced by whether the lower and upper lip looked proportionate together. So if just the upper lip or the lower lip was augmented, there were higher chances of it being perceived as fake. On the other hand, treating both the lips along with the Cupid’s bow gave the most believable result. But it was not just this lower to upper lip ratio. The researchers also felt that cultural and ethnic backgrounds also influence people’s perception on the attractiveness of lips. So that brings us to the fact that there is no one standard for the perfect lips. But having well-proportioned lips is definitely one half of the job done. And if you are considering to have this treatment, you need to take care that what you choose to get done will match with your face. Our cosmetic doctors are here to help you make the most of what you’ve got – beautifully enhanced lips that look great on you! We do this by looking at all of the aspects from the vermilion border, Cupid’s bow, the shape of each lip and the ratio between them. Our experienced cosmetic doctors and trained nurses take utmost care in delivering treatments with high precision and comfort. And you know you can count on us to do a beautiful job, to make you feel beautiful. As we grow old, our skin often tends to lose its glow, fine lines start to show, and it may even begin to sag. These could be a result of natural or external factors, but all of these add up to making us look older. While ageing is inevitable, it is possible to keep your skin looking young and radiant. There are many anti-ageing treatments available today. Premium quality anti-wrinkle injections are amongst the most popular ones. However, there are many who fear getting a “frozen face” as standard these injections are known to paralyse the forehead, and give an unnatural look. Dr. Kenneth Steinsapir, the celebrated Beverly Hills cosmetic surgeon believes that this is largely due to the fact that not all cosmetic doctors are adept in getting natural looking results from anti-wrinkle, muscle-relaxant facial injections on account of limited skill and experience, or no set treatment template. It is this fear that keeps away a majority of people interested in injection based anti-ageing treatments. And this is what inspired him to clinically study and develop the Mircrodroplet Lift, a new anti-wrinkle injection delivery method that gives effective results without the risk of a “frozen face”. So what is the Microdroplet Lift? The Microdroplet Lift is an anti-wrinkle, muscle relaxant injection that “lifts” the brow, and reduces fine lines on the forehead, without causing a “freeze”. While this isn’t very different from other anti-ageing treatments except in its application, it is very good at getting natural results. As part of this treatment, the brow is treated with very small injections to the tiny connecting points in the skin and muscles. It is not necessary to inject on the forehead. Put simply, it is a better way to get wrinkle free skin. Unlike other anti-ageing treatment injections that are only effective if administered with skill, the Microdroplet Lift uses common standardized processes on eyebrow depressing muscles. How is this treatment different from a regular brow lift? A regular brow lift typically injects up to .1ml in several areas around the eyes, including the forehead and around the eyes. This also entails a specific pattern of injecting, but needs to be done with a high level of skill and care; else the medication is diffused into nearby tissues, resulting in Ptosis or “Frozen Forehead”. The Microdroplet Lift procedure uses smaller, 0.01 – 0.03 ml injections instead, in the form of 60 – 100 microinjections just under the skin’s surface. What this does is that it traps the medication and doesn’t allow it to diffuse. This essentially weakens the brow muscles instead of completely relaxing them, and this eliminates the standard frozen effect of popular anti-wrinkle injections, as you can continue to make facial expressions. Anti-ageing treatments should make your face look natural, and not stunned. Because of the standardized way of administering injections, the Microdroplet Lift doesn’t have as many complications, while having the same longevity. Moreover, this procedure helps relaxing what is commonly known as “resting brow pinch”, which makes the brows go up and reduces forehead lines. This creates a look that is more natural, relaxed and friendly. Nitai Medical and Cosmetic Centre has some of the best skin experts on board in Melbourne. And if you’re looking for a reliable anti-ageing treatment with minimal risks in Melbourne, then contact us to know how you can get closer to a younger skin. What do dermal filler injections feel like? Looking for dermal fillers or facial fillers in Melbourne? 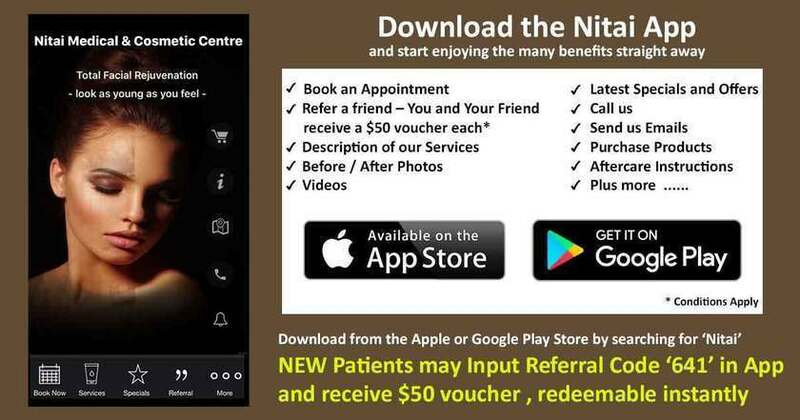 Then you’ve come to the right place, as Nitai is a leading medical & cosmetic clinic in Melbourne. This is typically for the face / lips area. After a dermal filler injection, your lips or face can feel “full”, as a small pocket of fluid has been injected under your dermal layer. While it might seem odd at first, it won’t be long before you adjust to this new feeling of fullness, as it will start to feel natural, after a while. In this case, dermal fillers are injected across your whole face in extremely small amounts using a micro injector. What this does is stimulate rejuvenation of new skin cells. A key ingredient of the dermal fillers, which is also found in our skin, is commonly used in these injections. Dermal filler injections are not meant to hurt, and getting one is a relatively painless procedure. This is because we use anaesthetic cream or injection, so that you feel no pain before or after the procedure. This is not to say that you can’t do without an anaesthetic. If you wish to stay away from anaesthetics, it may be a little uncomfortable, like any other injection. After the injection, it is common to have some swelling and minor bruising during the injection. But this subsides within a few days. And so there is nothing to feel daunted about doing this as part of a larger skin beautifying plan. If you wish to go ahead with an injection, choose a clinic with experienced cosmetic doctors and trained nurses. 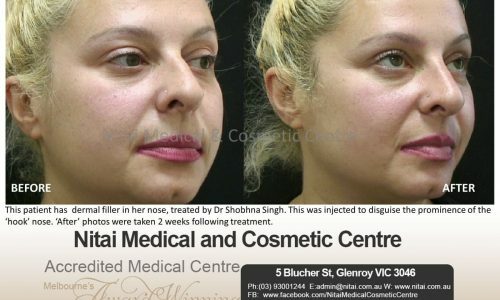 And this is where we differ from other clinics that offer the dermal filler treatment in Melbourne. Talk to us to know more about how you can get beautiful skin. Our skin is one of the most telling signs of our wellbeing. And everyone wants beautiful skin. After all, who wouldn’t want skin that’s soft, smooth and supple? However, our skin changes as we age. And there are other factors like sun exposure, heredity, diet and lifestyle that contribute to these changes. We tend to lose the subcutaneous fat that gives our faces a “fuller” appearance, increasing the likelihood of smile lines and crow’s feet. Not only this, fine lines and wrinkles start to appear too. Thankfully, help is here in the form of dermal fillers. There are many clinics offering dermal fillers in Melbourne. And Nitai Medical and Cosmetic Centre is known to offer high quality treatments when it comes to dermal fillers. Dermal fillers are a non-invasive, skin rejuvenation treatment that can help reduce facial fine lines, and restore lost volume and “fullness” to your face. They involve an injectable solution that fills the soft tissue under the skin. There are many areas where dermal fillers can be used, some popular ones being under-eye lines or crow’s feet, cheeks, lips, chin, face and hands. Sometimes, they are also used in cases where there are a lot of acne scars, to smoothen them out. To put it simply, dermal fillers can make your skin look younger – and make you look even more beautiful. How can dermal fillers help? Suffering from loose, saggy, dry skin? Dermal fillers can help by plumping up your skin, and adding more volume, filling out deep lines and wrinkles, contouring your face and bringing back the vitality that you’re looking for. What you get is radiant skin with improved production of essential ingredients responsible for cell growth, and skin that looks fresh and revitalized. The best part – they are a lot safer with well understood risks and much less expensive than a surgery, and what’s more, the effects can last up to a few months. Some popular types of dermal filler treatments at Nitai. Be it filling up under eye tear troughs, or smoothening out eye bags, dermal fillers is the best way to ease the transition between the lower eyelid and the cheeks. Have thin lips? Dermal fillers can help your lips look fuller, luscious and sensual. Restore volume and fullness to sagging cheeks, and get an instant facelift of sorts with dermal fillers. Fill out imperfections in your chin, and have a beautifully defined jawline with dermal fillers strategically injected in the chin and jaw. Your hands needn’t look older than you. Reduce wrinkles fine lines an restore youthful volume to your hands with rejuvenating dermal fillers. What makes dermal fillers so popular? 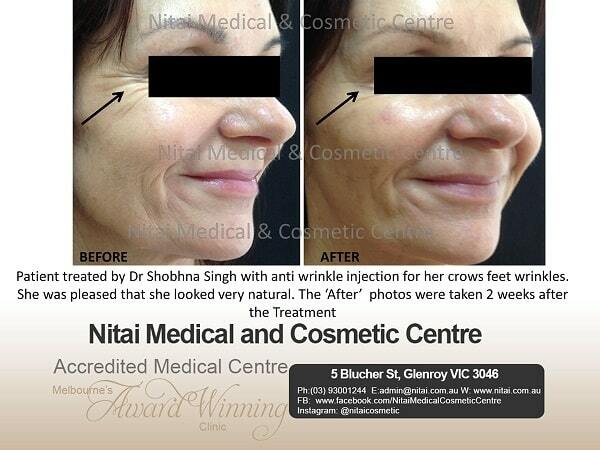 At Nitai, we offer a wide range of different dermal filler treatments to our Melbourne clientele. And we have a team of highly qualified and experienced practitioners, who work with the most advanced equipment in this field so that you have a comfortable treatment, and the results live up to your expectations. So that you can add more confidence to your beauty. Call us or email us to discuss how you can make your skin look beautiful. According to a recent report by the Australian Department of Health, one in ten people will get a tattoo at some point in their life. That’s a lot of people getting inked! While some think this trend is just a passing fad, tattoos have actually been around for thousands of years. Read on to learn a bit more about the history of tattoos. The remains of an Iceman discovered near the Italian-Austrian border in 1991 revealed something very interesting: the 5,200-year-old remains were sporting tattoo patterns. This is the oldest evidence of tattoos in existence. Tattooing was a common practice in ancient Egypt, and several tattoo artefacts and remains date back to 2000 B.C. In ancient Egypt, tattooing appears to have been exclusively for women. Many historians and archaeologists hypothesise that tattoos were used during that time to safeguard women during pregnancy and ensure a healthy delivery, as most of the tattoos were on women’s abdomens and had the appearance of a net. Later, in ancient Greece and Rome, tattoos have been found on the remains of both men and women. It is believed that tattoos were used by ancient Greeks and Romans to signify which religious groups they were members of. 40,000 years ago, the Samoan and Maori tribes used tattoos to convey and garner respect. It was seen as a mark of bravery to have a tattoo. The Native American tribes used body art similarly, and often times tattoos commemorated a courageous act. However, some tattoos from this era carry a less pure meaning. Many slaves and criminals were marked with tattoos as a means of record keeping, or in some cases, simply as a punishment. As Christianity rose in popularity, tattoos declined. Emperor Constantine actually banned tattoos as he believed they ‘disfigure[d] that made in God’s image’. However, some people still sought tattoos, including the sailors and soldiers who famously helped to spread the art form around the world. 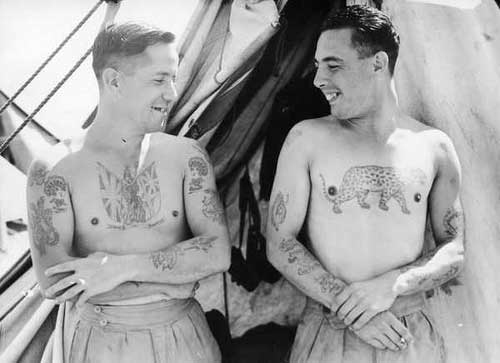 It is believed that most of the tattoos on these military men functioned as good luck charms to protect them when out at sea or war. In western society, some people used their tattoos as a form of entertainment and would join the circus to exhibit extensive body art. Tattoos became largely associated with people from society’s lower classes. Despite the fall in popularity of body art, in 1846, the first official tattoo shop opened in New York. Most of the tattoos were patriotic in nature, and they were almost exclusively commissioned by men. By the end of WWII, tattoos on men were widely accepted in society. In the late twentieth century, New York City continued to be a driving force in the tattoo industry. As techniques modernised, tattoos became more beautiful and intricate. Unique body art exploded in popularity throughout the 1940s, as members of elite European society were seen with them. Since then, tattoos have become more and more popular, notably among women and the middle class. Surprisingly, there is evidence of attempted tattoo removals that date back to the sixth-century. It seems that many measures were taken to remove tattoos, especially those located on the face, although none were successful. In fact, the resulting scar from the removal attempt was usually worse than the original tattoo. So, it seems, as long as people have been getting tattoos, there have been a few who have regretted that decision. Thankfully, forty years ago, laser technology was refined for the specific purpose of removing tattoos. For the best laser tattoo removal in Melbourne, come to Nitai. We use the Revlite laser, which has a variety of wavelengths to target specific colours. Best of all, the removal process is not nearly as painful as the original tattoo, and sessions take mere minutes. For more information on the tattoo removal process, check out Tattoo Removal: What You Need to Know; it covers all the basics and links to our FAQs on tattoo removal. There are two main skin issues that plague legs: unwanted hair and visible veins. Let’s talk about hair first. Not only is shaving annoying, but many women suffer from ensuing discomfort and unsightly razor bumps. If you have sensitive skin, then you know summer makes shaving even worse. All that sun exposure thickens your skin, making it easier to get ingrown hairs. The best way to keep your legs silky soft all summer long is to get laser hair removal. This is a surprisingly affordable treatment, especially when you consider that that the results are permanent. Laser hair removal works on any area of the body, even on your bikini line. Schedule your first appointment at Nitai today and you will be flaunting your fuzz-free stems on the beach! The second issue we see on clients’ legs are veins. There are two types of leg veins, and Nitai can treat them both. The first type are spider veins, those small, squiggly blue lines. Second are varicose veins, which resemble twisted cords beneath the surface of the skin. The procedure we use on spider and varicose veins is called scleratheraphy. This treatment involves injecting a special solution into the vein, causing the vein wall to collapse and disappear. It can take multiple treatments to see success, depending on the severity of your issue. Schedule your appointment at Nitai today to discuss how many treatments you’ll likely need; then you’ll know when you can expect to hit the beach with clean-looking legs. One important thing you should do to prep your skin for spending time at the beach is to have a full skin cancer check by our doctor. Before you spend extended periods of time in the harmful UV rays at the beach, you need to make sure you don’t have any suspicious spots. It goes without saying that even if your skin is in tip-top shape, it is still essential to wear SPF every time you’re out in the sun, and when you’re at the beach, you must reapply it every two hours. If an ageing, fading, or downright ugly tattoo has you hiding in the shade, make sure to come into Nitai for laser tattoo removal. Your tattoo will gradually fade with each treatment, which will help you feel more comfortable at the beach this summer! If you’re looking for acne treatment that won’t make your skin more sensitive to the sun, then come to Nitai for blue light therapy. This is one of the few acne treatments that doesn’t exacerbate the effects of the sun. Blue light therapy works by killing acne-causing bacteria on your skin, and if you’re spending loads of time at the beach, then you will definitely have accumulated sweat, sunblock, and debris in your pores. Blue light therapy will ensure all of that gunk doesn’t turn into a massive breakout. Last but not least, make sure to schedule your appointment at Nitai for anti-wrinkle injections. The truth is that the effects of the sun are incredibly ageing, so stop wrinkles from forming in the first place! Anti-wrinkle injections around the eyes are especially important in preparing you to spend tons of time at the beach, because they will keep you from squinting and prevent those dreaded crow’s feet. Once you prep your skin for summer, the only thing you’ll still need to do is find the perfect bikini to show off your gorgeous skin! Nitai knows that our clients have busy lives with loads of commitments: work, family, friends and healthy living. But making time to care for your appearance is so important; we know how powerful the confidence-boosting effect can be. You will be a stronger negotiator at work and a more patient mum when you feel your best, so make sure to regularly take care of you. Today we are sharing those treatments that should become a regular part of your routine. If you have any concerns about the safety of habitual cosmetic procedures, read our article about how safe they truly are! If you are struggling with acne and the sensitive, red skin that comes with it, then you need to pencil in weekly visits to Nitai for blue light therapy. This procedure is highly effective at killing acne-causing bacteria, but that doesn’t mean it’s harsh on the skin. In fact, this weekly procedure can be scheduled immediately prior to a date night or important business presentation. You won’t have any down time at all, making it a great fit with your already very busy schedule. Initially, coming in for weekly appointments is essential to getting your acne under control, but eventually you can enter into a maintenance phase and space your visits out a bit more. Each visit only takes 10 to 20 minutes. Because blue light therapy is so gentle, it makes a great accompaniment to other acne treatments. We can’t sing microdermabrasion’s praises loudly enough; it’s great treatment. 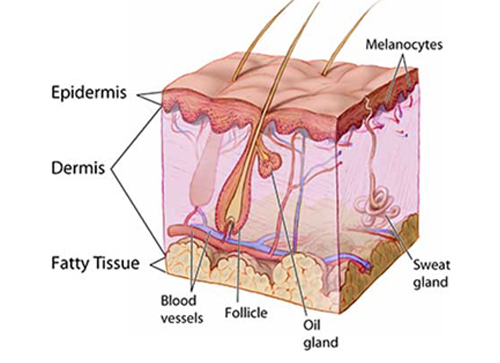 Over time, dead skin cells accumulate on the surface of the skin, trapping dirt and bacteria in your pores. Microdermabrasion begins with a thorough cleansing of the skin, followed by a gentle peel and steam to soften the skin and open those clogged pores. A diamond tip is then used in conjunction with suction to gently but completely exfoliate the dead layers of skin. The effects are dramatic. Acne is cleared up. Fine lines and wrinkles soften. Dull, lifeless skin is restored to a youthful glow. Enlarged pores appear smaller. Scarring and sun spots disappear. It really, truly is an amazing treatment that you should schedule monthly. We know you don’t have time to do nightly face masks or a 12-step routine, but thankfully, with regular microdermabrasion appointments your complexion will always look radiant. If you’re looking for the best wrinkle treatment in Melbourne, schedule biannual appointments for anti-wrinkle injections at Nitai. In just mere minutes twice a year, you can prevent sagging jowls, droopy eyes, and both small lines and deep wrinkles from forming. There really is no stronger way of treating and preventing wrinkles and ageing skin than regular anti-wrinkle injections. And with just two visits a year, you’ll appear decades younger! If you suffer from loss of volume in your face, make sure to come in for dermal fillers once a year. Lip fillers are one popular treatment to take years off your face, but dermal fillers are also used to smooth out deep wrinkles and plump up sunken cheeks. If your biggest complaint are those dark under-eye circles, an annual injection of dermal fillers in your tear troughs will fill in that hollow and eliminate those dark shadows. At Nitai, we think it’s important to take care of ourselves the same way we take care of everyone and everything else in our busy lives. Let us help. Scheduling routine treatments so that you will always look and feel your best. At Nitai, we love to get technical and thoroughly explain the science behind cosmetic issues and their treatments. Just take a look back at our article on the science of a sunburn — it’ll remind you about a few things you learned in school. We think it’s important that you understand what we do before you arrange a treatment, and we know that a lot of you feel the same way. So, today we’re bringing you the specifics on laser tattoo removal. Keep reading to find out exactly how permanent body art can become nothing but a memory. Before we can dive into tattoo removal, we first have to understand the mechanics of the tattoo itself. Your skin is made up of several layers, and if you go to a licensed tattoo artist, the tattoo will be created by creating tiny ruptures in the skin’s top layer—the epidermis—and depositing pigment in the deep dermal layer of the skin. Now, here’s what makes that image permanent: each time the needle ruptures the dermal layer of the skin, it creates a trauma site that your body immediately responds to in an effort to heal. Like all traumas, an inflammatory process begins. Macrophages are the rescue cells, sent to eat up the pigment and stop the inflammation it’s causing. Technology wins out in this case, though, as there is simply too much pigment for those macrophages to clean up, and the excess dye is instead soaked up by regular skin cells that permanently reside in the dermal layer. The pigment lies trapped in those swollen macrophages and skin cells, showing through your thin epidermis and leaving your design visible for the world to see. Until you want it gone. At Nitai, we use the Revlite system, the best laser tattoo removal option in Melbourne. A laser produces short pulses of incredibly concentrated and intense light. This light is capable of passing through your epidermis and reaching your dermal layer, and the light is completely harmless. It won’t burn your skin; that’s a common misconception about laser tattoo removal. What it does do, though, is fragment the pigment trapped in your cells into tiny particles. The macrophages and other scavenger cells from your immune system then work to clean up those tiny particles. Your tattoo will gradually fade in the weeks following treatment as the tiny specks of pigment are systematically expelled from your dermal layer of skin. If you’re curious what the experience is like, check out the videos on our website. For the most part, the laser feels like a rubber band snapping on your skin. The treatment only takes minutes, and most people have no side effects at all. It’s possible you might experience some dry skin, and the area will probably feel tender, similar to a sunburn, for a few days. It will hurt far less than the tattoo did. Most people require several sessions to completely remove their tattoo, and some tattoos will never become completely erased. Let’s take a look at why. The laser uses different wavelengths to target specific colours in the tattoo, as certain pigment colours will not absorb—and therefore not become fragmented by—certain wavelengths. For example, black ink absorbs all laser wavelengths, making it the easiest colour to remove. However, green pigment only absorbs very select wavelengths and has to be targeted accordingly. Also, keep in mind that there are nearly 100 different tattoo pigments on the market, meaning that each one is slightly different and responds to treatment differently. If your tattoo was done by an experienced professional, then it’s likely your pigment will be injected evenly, making it easier to remove. In the end, your tattoo will become considerably lighter, if not fade completely. If you’re looking for a Melbourne tattoo removal option, look no further. Come on in to Nitai for experienced, professional and thorough treatment! Pimples can strike at any time in your life, but it’s most common to suffer from acne in the teen years. With everything else today’s teens have to deal with, you don’t want your son or daughter to obsess and worry about bad skin. If you’re concerned that acne is your kid’s most defining characteristic, continue reading to learn about solutions that can stop him or her from being ‘the kid with the bad skin’. Nitai offers several different treatments for acne, and each is used to target a different cause. It’s important to meet with your doctor to assess your child’s specific skin issues, so it’s easier to pinpoint the best solution. It’s possible that medication will be the most effective remedy, but that’s often not the first or best treatment option for people that are still in their developing years. If you come in for a consultation at Nitai, we’ll discuss all the available treatments so that you can make the best choice. At Nitai, we have variety of laser and light treatments available to treat acne in teenagers, and our clients see amazing results from all of them. These treatments sometimes require a series of visits that can be challenging for today’s busy teens, but most appointments take less time than football practice, and there will certainly be no missed school days or violin lessons! Note that laser treatments are also used to treat the scarring acne leaves behind. Skin peels can also help treat acne in teens. Our skin peels range from mild to more aggressive, so your child’s skin will be assessed and down-time discussed before deciding on this treatment option. We hate to stereotype here, but often, teens just don’t take the time to properly wash their faces and treat their acne each morning and evening, especially boys. Make sure you speak to your son or daughter about the importance of following a thorough cleansing routine to clear up acne and prevent new blemishes from forming. Pick up proper skincare for your teen to encourage following a thorough regimen. Nitai carries an anti-acne lotion specially formulated for teenage skin, in addition to a full range of products to treat acne. Just stocking your kid’s bathroom with these products might be enough to get them started on using them regularly, which can definitely improve the appearance of their skin. To help them combat the redness associated with acne, read our article on reducing redness. A topical retinoid cream can also be prescribed for your son or daughter. This powerful product works quickly, and while it’s incredibly effective, it’s also completely non-invasive. Teens with sensitive skin might need to work up to using it by starting with just every-other day applications, and any dryness that occurs is easily treated with a hydrating lotion. Nitai offers the most cutting edge acne treatments in Melbourne, and our doctor understands the unique issues that cause acne in teenagers. Schedule an appointment today to help your son or daughter get rid of their acne and get back to enjoying the best years of their life!